The penetration of Distributed Energy Resources (DER) within the Distribution Network (DN) increases worldwide. A DN with high penetration of DERs responds dynamically to system disturbances and therefore affects the overall power system stability and dynamic behavior. 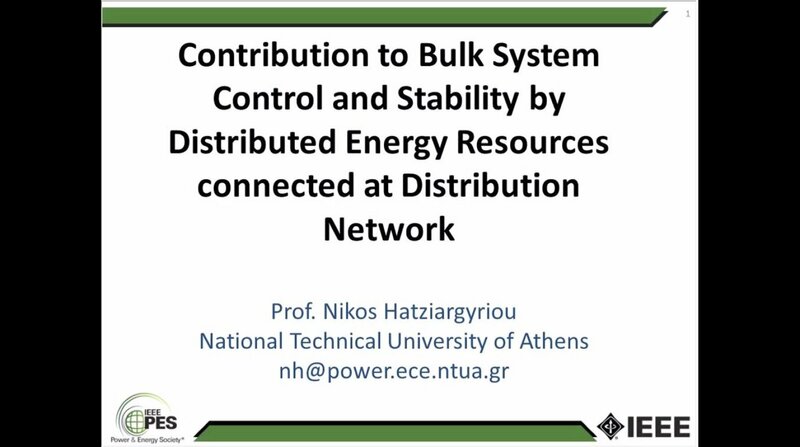 The webinar presents the main impacts of high DER penetration at the distribution grid on the bulk power system operation and describes basic elements of DER control in order to ameliorate these impacts. It also presents several case studies illustrating the DER ability to support transmission's network control and stability. It describes aggregate and equivalent DER models that can be used for steady state and dynamic analysis studies, in order to assess their impact on the overall power system dynamic behaviour, including modeling and control of microgrids. Finally, the report highlights recommended extensions of Regulations and Network Codes in order to improve cooperation of Transmission and Distribution Network operation.